Whether you’re allergic or not, the quality of indoor air is becoming increasingly important. An air purifier can make a major difference, but the manufacturers’ measures of capacity are often hard to interpret and it’s not easy to compare different manufacturers. Particles from exhausts and tyres are leading more and more cities to introduce restrictions on road traffic. In Stockholm, for example, the use of studded tyres is prohibited on particularly susceptible streets. Germany is discussing a future ban on diesel cars in cities. But our own homes are also a major source of harmful air pollutants. Building materials, furniture and clothing release dust and sometimes even harmful chemicals. For many people, an allergy to pollen is another problem. The microscopic particles don’t just stay outdoors, making their way inside on our clothes and through open windows and ventilation. Many people use an air purifier to reduce these problems. But the air purifier is also becoming an increasingly common feature in consumers’ homes where no-one suffers allergies or has respiratory problems. 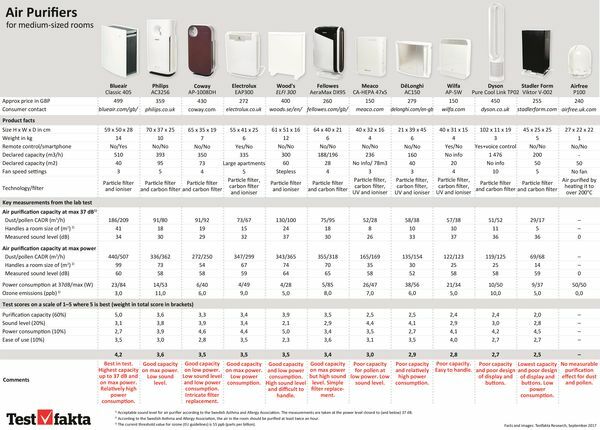 The range of both manufacturers and models has also risen sharply, but as a consumer it’s not always easy to interpret and compare the different technical descriptions of capacity that the manufacturers choose to present. What is expected from an air purifier? It basically comes down to the air purifier’s capacity to clean the air. But how do measurements such as cubic metres of air per hour or the room’s surface area in square metres translate into end performance? Different manufacturers and retailers also have different recommendations for how many times the air in the room should be cleaned per hour. The Swedish Asthma and Allergy Association has drawn up guidelines aimed at all types of consumers. They take account of the air purifier’s performance as well as technical specifications such as sound level and power consumption. An air purifier used in a bedroom should be able to clean the air twice in one hour. At that power, the sound level should preferably not exceed 37 decibels, which corresponds more or less to the sound made by regular mechanical ventilation in a home. To find out whether the manufacturers live up to these basic standards, Blueair commissioned Testfakta Research to carry out a comparative laboratory test of air purifiers in the Nordic and UK markets. In terms of capacity, the sample represents air purifiers in the medium segment. The manufacturers’ statements of capacity vary substantially and the industry lacks a uniform way of declaring these values. Some models state their capacity in square metres, others in cubic metres. And often figures refer only to how well the units circulate the air in the room, not how good they are at purifying the air. The tests were performed by the accredited and independent laboratories Intertek and IBR Laboratories in the UK. They were divided into four areas: air purification at 37 dB, air purification on max power, ease of use and ozone emissions. Air purification relates to the capacity to remove pollen and dust from the air. In the overall assessment of the outcome, naturally the air cleaning capacity carries the heaviest weighting, irrespective of the power setting. In brief, the test results show a considerable variation in the capacity to clean the air. In some cases there were also major deviations between the effect that the manufacturers claim and what was achieved in the test. One example of this is the Stadler Form, which claims to handle a room of 50 square metres on max power, but in the test it only manages 14 square metres. The air purifier with by far the highest measured air cleaning capacity is the Blueair Classic 405. Even on low power, the Blueair manages to clean the air in a space of 41 square metres, compared with 5–24 square metres for the others. The Airfree P100 air purifier showed no noticeable air cleaning effect in the laboratory test with regard to pollen and dust. The Airfree produces almost no measurable airflow, as it doesn’t have a fan. The Airfree uses a technique based on air convection and incineration of the pollutants using a heating element that heats the incoming air to 200°C. According to Airfree, it is not possible to measure the product’s performance by the method used in our test, as it destroys the pollutants in the air rather than filtering them out. To measure Airfree’s effect, the air needs to undergo microbiological analysis, which suggests that it would only have an effect on bacteria and other microorganisms, not on pollen and dust. When judging the air purifiers’ ease of use, the laboratory’s experts considered the design of the controls and buttons and how easy it is to replace the filters. Most of the air purifiers are quite easy to use, but replacing the filter can be a little fiddly on some models. The overall grading of the Wilfa and the Blueair, for example, was brought down a notch by a trickier filter replacement. There has been much debate about ozone and air purifiers. Ozone can be formed by air purifiers that use a technique where the air is cleaned by charging (ionising) the particles. The ozone is formed when the air containing the particles is also ionised. The EU has clear guidelines, since ozone that exceeds certain thresholds can be harmful to health. However, the test shows that none of the air purifiers exceed any of the thresholds. Testfakta Research has conducted a comparative laboratory test of air purifiers on behalf of the manufacturer Blueair. The purpose of the test is to compare performance for a selection of competing air purifier manufacturers in the Nordic and British markets. The laboratory test was performed by Intertek Testing & Certification and IBR Laboratories in the UK. 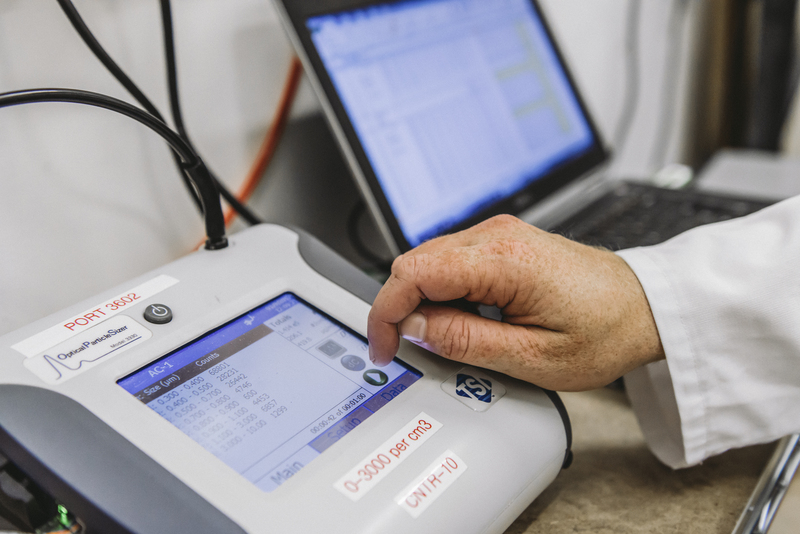 Testfakta has drawn up the test report together with the laboratories. 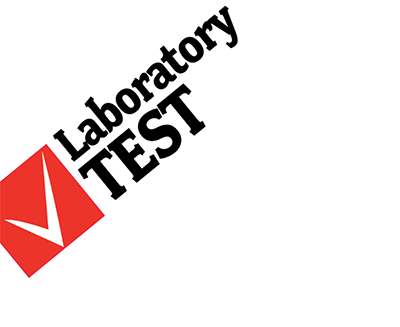 For more information on the test methods and weighting of results, please click here.